IQ58/IP58 programmable incremental encoders from Lika Electronic are conceived to be as multipurpose and adaptive as you need them to be. 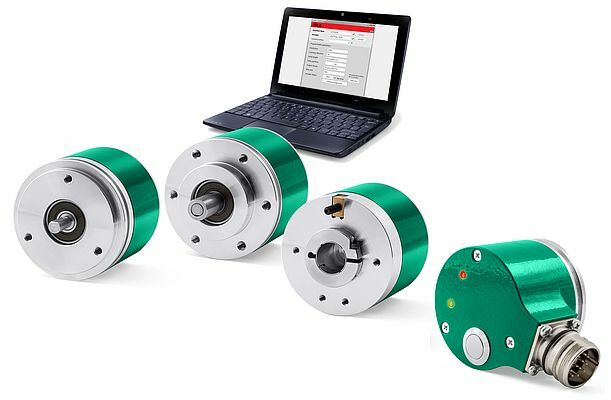 Thanks to both the full parametrization via PC and the broad range of mechanical and electrical connection options they are totally customizable and offer complete adaptability, versatility and freedom to meet the widest of specific industrial requirements. IQ58 is the general-purpose magnetic encoder for standard installations.It can be freely programmed to accommodate any value up to 16,384 PPR and provides AB0 and inverted /AB0 signals via Push-Pull and Line Driver compatible universal output circuit. The Index mark position and duration as well as the counting direction can be set via free PC tool. IP58 adds a plus of valuable benefits. It allows resolutions up to 65,536 PPR with precise and accurate (±0.005°) optical scanning. It is fitted with a push-button mounted on the external enclosure to comfortably set the Index mark at any position (in addition the Index mark can be set via PC or by applying a remote signal). Furthermore it allows the output signal voltage level to be programmed to either +5Vdc or according to the input voltage (+5Vdc ÷ +30Vdc). Two LEDs for improved diagnostic information complement the standard features of the high-end model. Hollow (Ø 14, 15 mm; 0.55", 0.59") and solid (Ø 6, 8, 9.52, 10, 12 mm / 0.24", 0.31", 3/8", 0.39", 0.47") shaft versions are available with IP65 protection rating. IP58 further allows for optional extended -40°C +100°C (-40°F +212°F) operating temperature. M12 and M23 connector as well as cable options in either axial or radial output are offered.